Audience: Superhero comic book fans, video game fans, anime/manga fans. "A superhero action comedy web serial about a superheroine who can conjure items and abilities from video games." 'Gamer Girl' is a superhero action comedy web serial written by Joe Berridge Beale. It follows the bizarre adventures of Ralphie Hero, aka Gamer Girl, a superheroine with the superpower to summon the items and abilities of video game player characters. Working alongside her partner Comikazé ‘Kazé’ Maniakku, aka Fangirl, a superhero fanatic with an electric fan gun, Ralphie sets out to make a name for herself in a city already full of crime fighters. Between the monsters, the supervillains, and Ralphie’s mild sociopathic tendencies, it does not go well. You can help the web serial grow by voting for it on Top Web Fiction once a week and reviewing it on Royal Road Legends, Web Fiction Guide, and Muse’s Success. You can also add tropes to Gamer Girl‘s TV Tropes page and watch it on Web & Light Novel Updates!. Please comment and follow (I could seriously use the feedback). 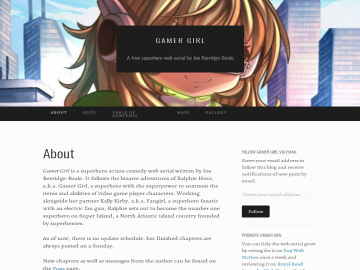 Lastly, if you want to keep totally updated on all things Gamer Girl, you can follow the Gamer Girl WordPress site. Gamer Girl has not been reviewed yet. Gamer Girl has not been recommended yet.